So, I had these two tops. One is a light-weight woven cotton with pink/rust/orange/beige/cream stripes; the other is a basic rusty orange pocket tee. The striped top is a XXL and has a small hole in the front. The orange tee is an XL and has a large stain of mysterious origin on the back. 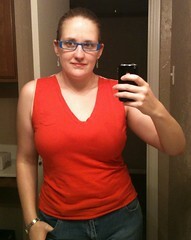 I cut the sleeves off both tops and cut down the sides, in a bit from the original seams since both were too large. 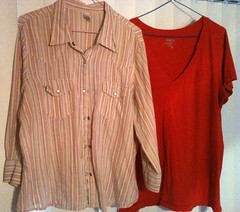 I also cut just below the collar on the striped shirt. 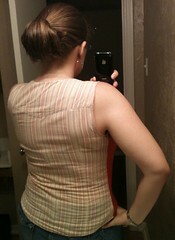 Then I sewed the orange front and striped back together at the shoulders and sides. 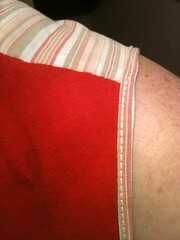 I folded over and sewed a hem at the back of the new collar (the tee's collar I left intact). The extra length on the orange tee was cut off and the edge left raw. 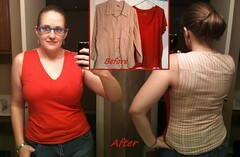 Finally I cut two long 1-inch strips from the front the striped shirt and used them as binding around the armholes. My husband thinks it looks weird, but I like it. In other news, check out my other weekend thrift store find: a black strapless dress with a little black and white polka dotted ribbon around the waist. It still had the original $65 price tag on it, and I only paid $6. And as a bonus, no alterations necessary. 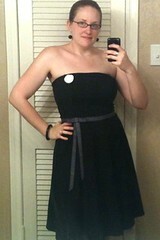 Sure, it's a little prom-ish, but I still like it. I decided to go with an entirely black and white ensemble - pinned on my white zipper brooch (created here), wore my black wooden bangle and matching earrings, carried my white bag, and slipped into my black kitten heels.